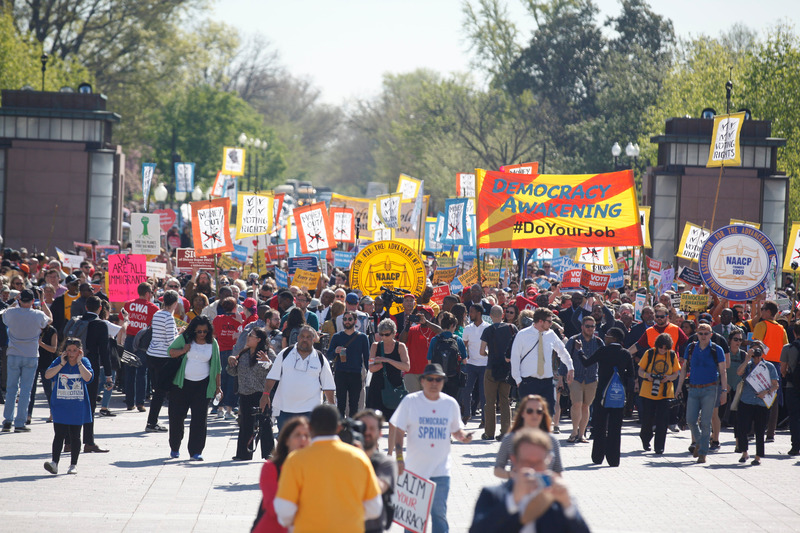 This weekend, a mass movement of thousands of activists and advocates from more than 300 labor, environment, civil rights, and faith organizations, descended on Capitol Hill for Democracy Awakening in a brilliant display of solidarity and action to demand an equal voice in our democracy and government that is accountable to people. Collectively, the democracy movement is fighting the power of money in politics on our political system, to protect and advance voting rights, while demanding a hearing and vote on the Supreme Court vacancy in the Senate. Reporters and journalists covered the weekend’s events, with stories appearing in The Nation,Washington Post, TIME, MSNBC, USA Today, Vox, The American Prospect, Politico, and Bill Moyers. Check out our Storify for social media coverage of the weekend’s events. 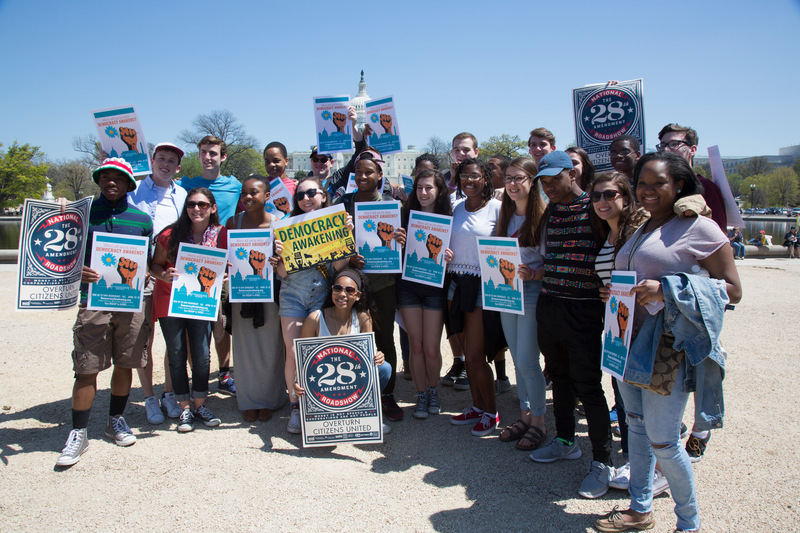 Democracy Awakening, a three day event that followed the earlier Democracy Spring protests last week, began on Saturday with a full day of panels, teach-ins, and workshops on the crisis our democracy is facing. Hosted at All Souls Church in Washington, DC the kick-off panel was moderated by Stacey Long Simmons of the National LGBTQ Task Force and featured voting rights expert Ari Berman, author of Give Us the Ballot, money in politics reform advocate Derek Cressman, author of When Money Talks, and People for the American Way Executive Vice President Marge Baker to discuss and answer questions about how voting rights, money in politics, and the Supreme Court vacancy obstruction are damaging our democracy and how we can fight back. Another panel featured the Democracy Initiative Education Fund’s report, Democracy at a Crossroads: How the One Percent is Silencing Our Voices with CWA’s Jessica Newman, Nick Nyhart of Every Voice, and Greg Moore of the NAACP National Voter Fund. 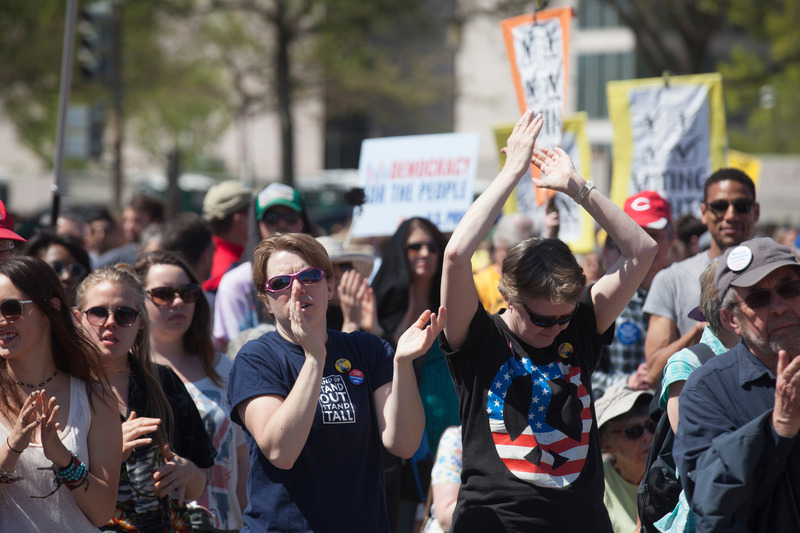 Sunday commenced the Rally for Democracy, where thousands of people joined together in front of the Capitol for a day packed with music, powerful speakers, and dancing, culminating with a march in solidarity that passed the Capitol and Supreme Court. 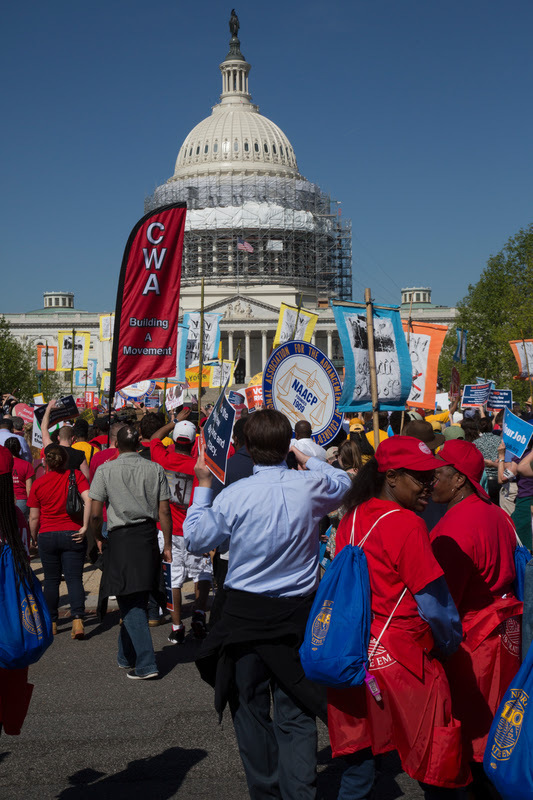 Speakers included NAACP President & CEO Cornell Brooks, CWA President Chris Shelton, AFL-CIO Executive Vice President Tefere Gebre, Greenpeace Executive Director Annie Leonard, Common Cause President Miles Rapoport, actor Kathleen Turner, and others. With music by Sweet Honey in the Rock and Aztec Sun, the day was an inspiration for all to fight for our democracy. 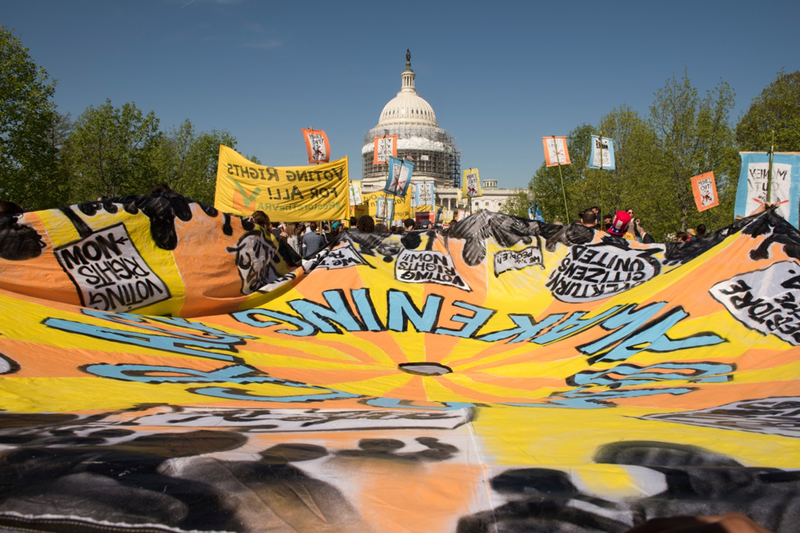 Monday was dedicated to non-violent direct action on the Capitol steps, followed by an advocacy day with congressional offices. Beginning early in the morning at Union Station with nearly 3,000 people, including immigration activists in solidarity, a short ceremony preceded a march directly to the Capitol steps. 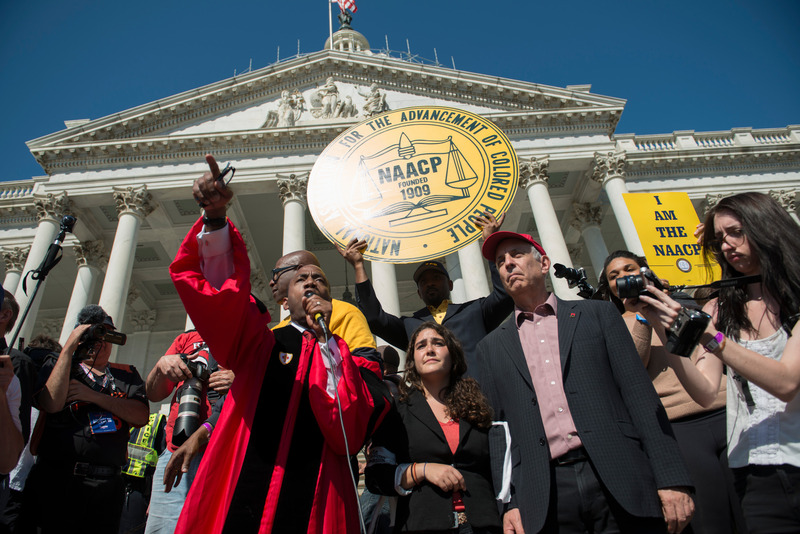 Despite warnings from the Capitol Police, more than 300 activists, including dozens of high profile leaders, stayed on steps to protest money in politics and Congress’ inaction on voting rights and the Supreme Court vacancy, while demanding a Congress of Conscience. Leaders included Democracy Initiative Chair Larry Cohen, Public Citizen President Rob Weissman, Greenpeace Executive Director Annie Leonard, Every Voice President Nick Nyhart, NAACP President & CEO Cornell Brooks, Rev. Dr. William J. Barber II, and others. Their dedication and solidarity led to 306 arrests – a strong statement against Congress and a call to arms for everyone concerned about the future of our democracy. 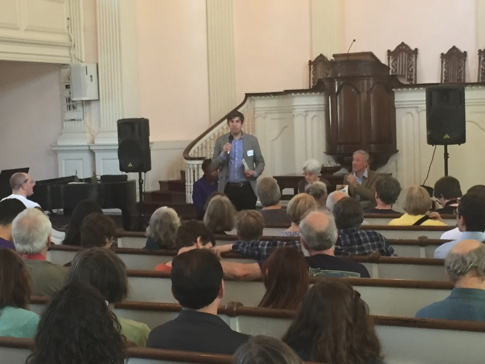 Following the direct action and led by People for the American Way, more than 150 advocates held 50 meetings with members of Congress including Rep. Capuano, Sen. Kirk, and Sen. Tillis to articulate the vision for strong, healthy democracy. The movement for democracy is just beginning. People are joining together to fight for the strong democracy our country needs in order for all Americans to have an equal voice. In the coming months, Democracy Initiative endorsers and allies will continue to fight to end the power of money in politics and expand voting rights, while holding Congress accountable. There will be opportunities in states to make a difference in the way people can affect the political process. The Democracy Initiative will be working closely with our partners to build a democracy that is of, by, and for the people.